Activity has decreased lately, with only occasional small explosions and weak steaming observed.  The MODIS data show no longer a hot spot, suggesting that lava effusion has more or less stopped. Tungurahua volcano in turn has remained calm. A slowly decreasing trend of activity is visible, but there are still occasional small explosions and strong degassing. Volcanic earthquakes and tremor fluctuates between low to moderate levels. IG reports surface and internal (seismic) activity at stable, moderate levels. A steam plume rising 700 m above the crater, where a lava dome continues to grow, was observed. Seismic activity remains elevated with fluctuating intensity, dominated by signals corresponding to internal fluid movements. A steam column was seen rising 1 km above the crater yesterday. Seismic activity remains alternating between periods of calm and bursts of tremor / explosion signals. Activity has remained stable at fluctuating moderate levels, but can rarely be observed directly due to near-constant cloud cover. Explosions and volcanic tremor, sometimes strong as earlier today, are visible on seismic recordings. Strong steaming was observed during a window of clear weather. The seismic activity remains moderately high, with numerous moderate long period earthquakes, harmonic tremor pulses and signs of moderate explosions. A rare clear view from the webcam shows a strong degassing plume today. Seismic activity has been moderate. Seismicity has declined a bit today. A thermal anomaly at the summit and continuing explosion earthquakes mixed with low-level volcanic tremor suggest that lava extrusion at the summit crater has resumed (or rather continues more vigorously) these days. Activity fluctuates between relatively calm phases and strong ash emissions. In the evening of 13 March, a steam and ash column was seen rising 3 km above the crater. The volcano's activity is considered moderate. In the afternoon of 12 March, IG staff and observers noted incandescent material rolling down the slopes of the volcano (mainly on the southern side). A column of steam and ash occasionally reaches 1km height, but most of the time, emissions have been weaker than that. Magma continues to arrive in the summit crater, evidenced by glow observed during the night. The seismic station experiences transmission problems, but still shows many long-period earthquakes as sign of internal activity at the volcano. The eruption at the volcano continues at fluctuating levels, which is reflected by the seismic signal. Yesterday, an ash column rose 2 km above the crater and drifted to the west. No reports of ash fall were received by IG. Tremor has decreased, but there are still many volcanic earthquakes and explosion signals. Activity remains high with strong constant tremor visible, likely accompanying lava effusion from the rarely visible summit. Seismic activity with continuous strong tremor continues, but cloud cover prevented direct observations of the ongoing activity (likely lava dome grown with lava flow extrusion as well as ash emissions). During the afternoon of 31 Jan, an strong emission column of steam and moderate ash content could be observed rising 3.5 km above the crater. Seismic activity remains at a high level, with a daily average of 20 earthquakes related to fluid pressurization and movement inside the volcano, and a daily average of 29 explosions since 22 January.